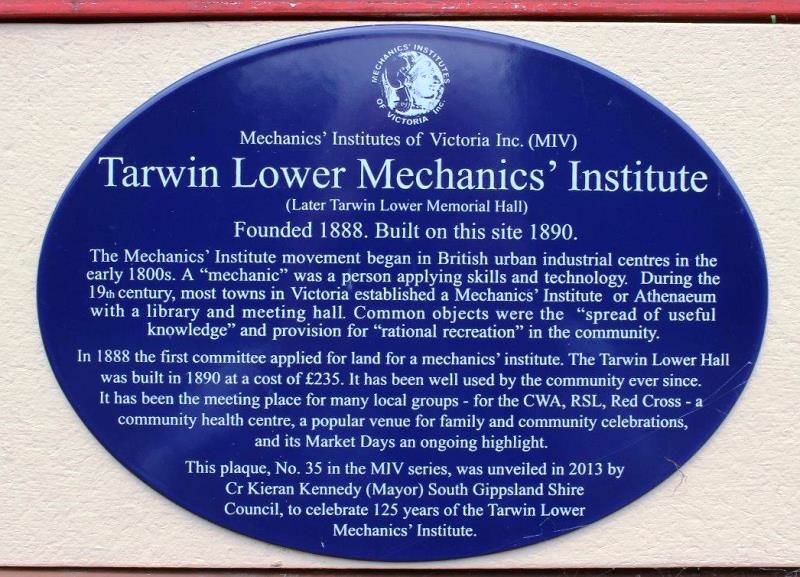 The Mechanics Institute plaque commemorates 125 years of the Lower Tarwin Mechanics Institute. The Tarwin Lower Mechanics' Institute Library and Hall was built in 1890 at a cost of £235, and was opened on 7 March of that year by FC Mason MLA. The cost of the land was £6/12/6 and the first trustees were Alfred Brown, Thomas Lees and Robert Fisher. The hall was the first public building erected in the township and was also used as a school and church. It is now believed to be the oldest extant building, public or otherwise, in Tarwin Lower. Between 1926 and 1933 the Hall was extended with financial assistance from George Black and other public donations, when it was officially renamed as the Tarwin Lower Memorial Hall in memory of local people who served in the First World War. The 11 August 1933 edition of the "Great Southern Star" reported that the official opening of the additions to the Tarwin Lower Hall took place on 1 September 1933. The purpose of the MIV Historical Plaques Program is to inform the public of the history of Mechanics' Institutes in Victoria and also give a snippet of history about the individual Institute. The idea of putting a plaque on Mechanics' Institute Halls was advanced by Committee member Alan Tonkin in 1999. Committee member Paul Permezel brought it to reality in 2003 and since then plaques have been installed to mark special occasions within Institutes all across the State. These plaques have been used to commemorate a significant date in the history of an Institute or town; be it an anniversary, or a significant renovation or restoration project. (Later Tarwin Lower Memorial Hall ). Founded 1888. Built on this site 1890. The Mechanics' Institute movement began in British urban industrial centres in the early 1800s. A "mechanic" was a person applying skills and technology. During the 19th century, most towns in Victoria established a Mechanics' Institute or Athenaeum with a library and meeting hall. Common objects were the "spread of useful knowledge" and provision for "rational recreation" in the community. In 1888 the first committee applied for land for a mechanics' Institute. The Tarwin Lower Hall was built in 1890 at a cost of £235. It has been well used by the community ever since. It has been the meeting place for many local groups - for the CWA, RSL, Red Cross - a community health centre, a popular venue for family and community celebrations, and its Market Days an ongoing highlight. This plaque, No. 35 in the MIV series, was unveiled in 2013 by Cr Kieran Kennedy (Mayor) South Gippsland Shire Council, to celebrate 125 years of the Tarwin Lower Mechanics` Institute.